9 Hard Boiled eggs, cut in half with yolks separated. Mix well and put yolk mixture in a pipping bag and evenly add yolk mixture to the egg white shells, garnish with some paprika. 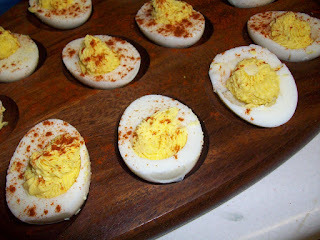 I love deviled eggs!! I make mine almost the same way. Only difference is I use dill relish instead of sweet (can't stand the sweet stuff) and I've never tried it with Garlic powder. I'll have to use some next time I make them. I love your blog. I'm your newest follower. New follower from the Sunday Hop! Lord knows there's nothing like a good old Deviled egg, my family enjoys them it's the after effect that gets us all. LOL! Plz follow back! YUM! I love deviled eggs. I like to add a little bit of ranch dressing to mine. One of my favorite foods! Thanks for joining my Planet Weidknecht weekend hop! always a classic favorite! Thx for linking to Tea Party Tuesday at Sweetology.